Performance enhancements, FedEx/USPS changes & more! USPS Retail Rates, Coming soon: Sage 300. StarShip uses USPS Retail Rates as list rates. Now supports USPS Pitney Bowes for electronic postage. V-Technologies has partnered with Pitney Bowes to add value and savings to your USPS shipping. StarShip users will receive a FREE* postage account for 3 years (a savings of up to $34.95/month vs your Endicia account). * Save with USPS discounts and free postage earned through their rewards program. Updated address validation and preparation for upcoming USPS changes. eCommerce – WooCommerce Shopping Cart, New Acumatica API interface, OnTrac Web API, Support for Sage 500 ERP 2017 and more! StarShip’s eCommerce interface now supports WooCommerce shopping carts. eCommerce – eBay, Amazon Shipping, YRC, OnTrac, A. Duie Pyle, & Estes changes and more! StarShip’s eCommerce interface has undergone a number of upgrades. Now supports Amazon Shipping as a carrier, which allows you to ship your Seller Fulfilled Prime Orders. Expanded to include eBay, so you can ship both your Amazon Orders and eBay transactions from one interface. OnTrac labels are now printed with the PDF-417 barcode, which contains important shipping information, such as the Recipient Name, Address, and Zip Code, along with the service offerings requested for the delivery. has an added setting to accommodate users who have pallet pricing. Requests a PRO number from Estes when a shipment is processed. USPS 2017 rate update, OnTrac updates, UPS Freight enhancements and more! 2017 carrier rate/service update, Sage 100 2017, LTL Printing Enhancements and more! New! UPS Carbon Neutral – reduce your climate impact while demonstrating your commitment to sustainability. For interfaces with item-level integration: associate an item to a profile for further hazmat automation. Coming Soon: HazMat/Dangerous Goods documentation for FedEx shipments will be available in a subsequent v11 release. Documentation for UPS shipments is currently in development. Obtain proof of delivery for FedEx shipments. Define different fields based on mode (parcel/ltl). V-Technologies partners with Highjump to provide a more seamless shipping to EDI experience. You have the option of producing the GS1-128 label from StarShip or TrueCommerce Transaction Manager. 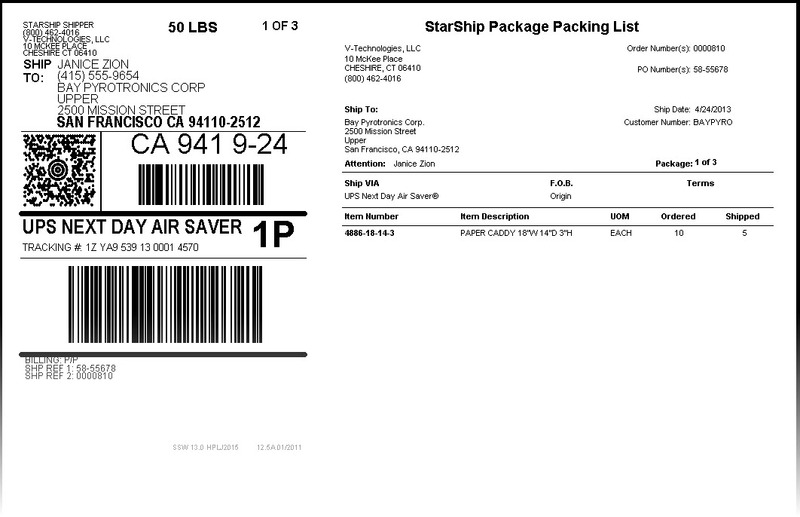 Producing the label in StarShip allows all shipping labels to print at the same time. On ship/process, StarShip will transparently send shipment detail to TrueCommerce for final creation of the ASN to the trading partner. StarShip continues to expand LTL offerings with the addition of Con-way, the nation’s 2nd largest LTL carrier. This rounds out the support for the top 4: FedEx Freight, YRC and UPS Freight. The Con-way module allows you to rate directly on the Con-way servers giving you live access to negotiated rates. In addition, you now have the ability to track, request pickups, generate the BOL and print package/pallet labels. We continue to add enhancements to support new features being offered by Endicia. Users running StarShip across multiple locations now have the ability to specify a location ID in the Endicia transaction. This ID is printed on the label and allows the USPS to better handle delivery issues. Endicia Professional customers can now print the SCAN form based on sender ZIP or cost center. Expanded the number of address lines for the 4×6 integrated Customs form and Express Mail. PS 2976 Customs form is now allowed for all mail classes, irrespective of package weight. New FedEx module, GS1-128 labels and more! Now available! FedEx Freight – a top US LTL operator. FedEx 2Day(r) A.M. – 10:30 a.m. delivery commitment time for shipments with two-day delivery to most areas in the U.S.
FedEx First Overnight(r) Freight – nationwide, early-morning delivery of critical air freight shipments. Most markets will have a 9 a.m. delivery commitment. This service is tailored for customers with urgent manufacturing, distribution or replenishment needs and for palletized shipments weighing more than 151 lbs. GS1-128 labels to streamline EDI shipments. Use sample templates or modify the layout in StarShip. StarShip now generates the SSCC number. Roles and permissions – expanded to give administrators more control over user actions. Enhanced shipment editing and printing functionality! Condition builder allows you to define when a label or document should print. Batch Import functionality, client memory optimization & more! 2012 Carrier rate/service changes & more! The current module will support rate & service changes effective Jan. 2nd. We are actively working on enhancing the FedEx interface to support the new features below. This will be available as an update to v12 and we expect a general release in August. Coming Soon: FedEx 2Day® A.M. Acknowledgement of Delivery (AOD) enhancements to support Direct, Indirect and Adult Signature Required. Modifications to support new USPS features & postage changes were released in version 12.0.2. This release also included enhancements to ease the process of printing international customs forms. Added support for the 2976A form to print on a 4×6″ thermal label. Enhanced roll-up options for content description on the 2976A. *USPS will now require an addressee’s signature only when explicitly requested. QuickBooks Enterprise integration, ship via rules functionality, Rating Web Service and direct support for ABF Freight. Rating Web Service – Integrate StarShip’s powerful multi-carrier rating functionality directly into your business systems such as ERP order entry. Sage DacEasy 2014 – testing is complete for this version of Sage DacEasy. New branded email functionality, integrated packing list + shipping label, expanded EDI & Warehouse Management integration. Con-way and Old Dominion – optional carrier interfaces now available! 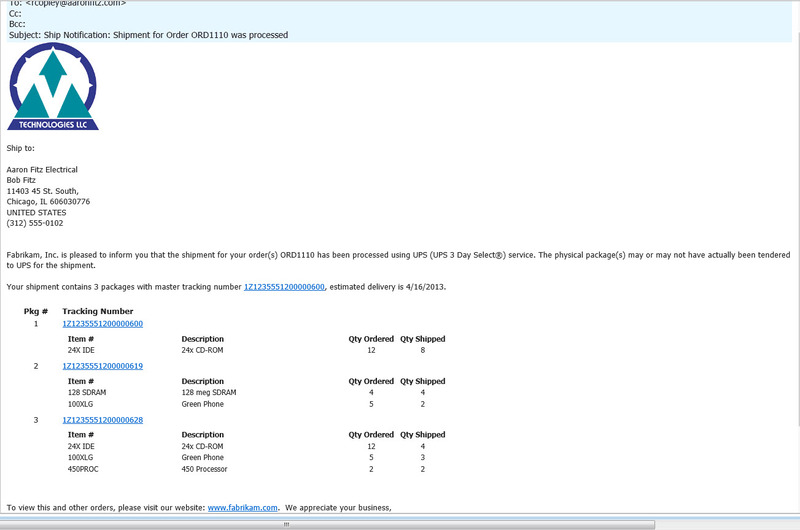 Branded Shipment Notifications – take control of your outbound email notifications! GP Advanced module highlights integration with PanatrackerGP to automate the pick, pack & ship process. Sage 500 2013 – testing is complete for this version of Sage 500. 2013 USPS rate/service changes, Sage 100 ERP 2013 & more! We continue to add enhancements to support USPS regulatory changes and new features being offered by Endicia. The Parcel Post mail service is being renamed to Standard Post. This newly renamed service will be available at retail ONLY and includes electronic tracking at no additional cost. While this service will continue to be available to USPS Approved Shippers, commercial mailers should use the Parcel Select, barcoded, non-presorted mailing option in place of Standard Post (previously called Parcel Post). The First-Class Mail International Parcel service is being renamed to First-Class Package International Service (FCPIS). First-Class Mail International Letters, Postcards, and Flats services remain unchanged. Electronic Delivery Confirmation will now be available free-of-charge for international packages to Canada. This service provides mailers with the date and time that their package was delivered. Service will be available for the following mail categories: First-Class Package International Service (formerly First-Class Mail International) parcels, Priority Mail International Flat Rate Envelopes, and Small Flat Rate Boxes. Critical Mail will be available with a new signature option. This signature service will be added to the Critical Mail service at a more attractive rate than adding Signature Confirmation as an extra service. The label layouts of the Integrated Customs Forms PS-2976 and PS-2976A have been modified per USPS guidelines. Expanded the Cost Center field to support alpha and numeric characters. Sage 100 ERP 2013 (v5) BOI interface – Testing is complete for this version of Sage 100. Form code printing as a result of ship/process is currently not supported with the 2013 release. ACS Multi-Bin – enhanced the BOI (direct) interface to support this popular enhancement. StarShip will now recognize items that have been allocated via ACS Multi-Bin and retrieve associated lot/serial distribution and quantity. 2013 Carrier rate/service changes & more! UPS WorldEase® – ship packages to multiple recipients within a country or the European Union (EU) as one shipment that clears customs as a single transaction. The current module will support rate & service changes effective Jan. 7th. We are actively working on enhancing the FedEx interface to support new features such as the 1421-C (Dangerous Goods). Ship Screen – search existing shipments and switch between interfaces from the Source Document section. Dynamics GP Rate Quote and Custom Writeback, New Reports, AESDirect and Branded Email enhancements and more! StarShip Rate Quote from Sales Transaction Entry – this customized rate quote functionality offers address validation, custom carrier rates, and time-in-transit details from Sales Transaction Entry (doesn’t require a seat!). Rate Quote can also update the address, ship via, and freight charge. UPS Capital, Sage 100 v2014, Sage 500 v2014, enhanced rate quote and new Freightview domain address! Access to StarShip Rate Quote directly from Sales Order! This customized rate quote functionality for Sage 100 offers address validation, custom carrier rates, and time-in-transit details from Sales Order Entry. Rate Quote can also update the address, ship via, and freight charge. New modules, enhanced dashboard and more! Improve brand exposure and increase chances for repeat sales by adding your logo and customized text at the top of the label. A stand-alone application that can run from anywhere you have internet access! Give customer service personnel access to StarShip rating and time-in-transit detail to make informative decisions prior to shipping. Quick Ship – for our StarShip Link users, the Quick Ship button streamlines the workflow when shipping orders complete. Use it to perform “ship remaining” AND launch StarShip in one click. As always, V Technologies continues to go through certification requirements to ensure compatibility with the latest enhancements and technologies. Are you manually accessing rate quotes through averittexpress.com? Eliminate this manual step and gain better insight into ALL of your shipping costs/options without logging in to multiple websites. Our next generation UPS module uses the latest web services technology to eliminate end-of-day PLD uploads, give you access to Mail Innovations & more. We announced our Amazon integration last release and are actively enhancing it! The latest Amazon interface allows you to “ship complete” without defining the item quantity in StarShip. Consolidate multiple parcel or freight shipments into 1 LTL shipment. Extending the packaging scenarios function to include pallet level logic. One more way to help you save on freight spend! We’ve partnered with Parcel Partners to give you access to Commercial Plus Pricing (CPP) with no contracts or minimum volume requirements. First Class Package Service up to 16 oz. On top of this you now have access to USPS electronic COD labels! Interface to CubiScan scales, FedEx One Rate, Dynamics GP Fulfillment, Batch Shipping, Custom EDI. Have you been impacted by the DIM weight changes put in place earlier this year? New interface to CubiScan scales (models 100, 110, 125 and 150) to automate dimension scanning and make sure you’re quoting the appropriate freight to your customer. FedEx One Rate®, a simple, flat rate pricing option for FedEx Express® packages within the U.S.
Added support for the FedEx® Extra Large Box 11″x12″x11″). Dynamics GP Fulfillment – StarShip can automatically fulfill items on your Dynamics GP transaction and we’ve added a setting to prevent shipping items already fulfilled. Batch Shipping – We’ve added the ability to batch ship a group of orders and define exactly how you want everything updated in Dynamics GP.! Export details (as you ship) in a user-defined format to ultimately be used by your EDI system for automated ASN (Advanced Ship Notice) generation. BATCH SHIPPING and Enhanced Search – Use filters to better manage your document view. Select a batch of orders and StarShip will process the shipments, print labels and update the source document in one click! Rate Shop from Sales Order – Take advantage of StarShip’s powerful rating engine while creating estimates or orders. Use this to help with your carrier/service decision, validate addresses and update freight charges (including customized rules). Custom Field Updates – You now have complete control over how StarShip shipping data is updated on your Dynamics GP document! Want to update the ship via to reflect how your package actually shipped? …or update the ship-to? Now all possible! Priority Mail Cubic Pricing – do you ship small, heavy boxes? Packages that weigh less than 20 lbs. and measure .50 cubic feet at most are eligible and you could save BIG! …and this year the USPS significantly dropped the number of pieces needed to quality from 150,000 to 50,000!Sending a 20 lb., 3x4x8″ package from CT to OH would normally cost us $19.38. With cubic pricing that same package could cost as little as $4.99! Create an unlimited number of them! Useful for taking advantage of rules-based processing (ship via rules, freight rules), custom email notifications, reporting and GS1-128 labels. Save money on carrier fees, simplify billing & streamline the claims process for all small package shipments! Request a quote! More flexibility to define “From” email. 2 new standard reports: Return Shipments, Shipments By User. The FedEx module now includes support for shipments originating in Canada. Contact us to update your FedEx license with a Canadian account. The UPS module now includes support for shipments originating in Canada. Contact us to update your UPS license with a Canadian account. Shipping international goods? The way you submit your EEI filing information when processing a shipment in StarShip has changed. See: AESDirect to ACE. StarShip now supports carrier security updates for UPS, FedEx, OnTrac, Estes, Old Dominion and others. New minimum system requirements include Windows 7 or higher. For a full list of supported operating systems, see: SHA-2 Security Updates. USPS/Endicia 2016 rate & service changes went into effect: Jan. 17, 2016. Updated prices for January 17, 2016, including new country groupings for Priority Mail International Flat Rate Boxes. Parcel Select Nonpresort will be rebranded as Parcel Select Ground™, and Standard Post will be rebranded as Retail Ground™. The First-Class Package Service (FCPS) 14, 15, and 15.999-ounce offerings will be made available to Commercial Base users. A new integrated customs form label format will be implemented for both domestic and international shipments that require customs forms (PS Forms 2976, 2976-A, and 2976-B). Your Endicia software will automatically pick the correct form type and number of pages required. Up to $200 of merchandise insurance will be offered for Priority Mail International with the exception of Priority Mail International Flat Rate Envelopes and Small Flat Rate Boxes. 2016 carrier rate/service update, A. Duie Pyle and Dayton Freight carriers, updated R+L, Endicia Global Service, Amazon enhancements and more! Expedited shipping to Brazil and Mexico with a domestic label and no customs forms! Same-day customs clearance. Shipments clear customs in as little as six hours as opposed to an average of five days. Fast service. Shipments are delivered in eight to ten days. End-to-end tracking. Endicia Global Service provides tracking and delivery scan rates that are equivalent to what shippers are accustomed to in the United States. Price transparency. All duties and taxes are known at shipment creation. Endicia Global Service allows businesses the option to deliver products duty-paid. This means that taxes can be paid up-front rather than collected from the customer on delivery. Reduced shipping complexity, with no customs forms to fill out and no need to print duplicate labels. The latest Amazon interface allows you to see the status of your eCommerce Orders in StarShip.